Check out the craft beer scene in these RTX locations. The craft beer movement has taken the country by storm, and many travelers incorporate a visit to at least one local brewery into their vacations. There are several breweries, microbreweries and brew pubs in the Lake Tahoe area that craft beer lovers frequent for a tasty pint, often served along with delicious food. If you have an affinity for a refreshing and hoppy drink, check out the brew scenes in these RTX destinations. The St. Pete / Clearwater Craft Beer Trail runs from Tarpon Springs to Treasure Island on Florida’s Gulf Coast. At last count, 14 privately owned breweries and brew pubs reside on this trail that only takes an hour to drive from end to end. Start by visiting www.visitstpeteclearwater.com where a map of the self-guided tour is available along with summaries of each of the breweries. Plot your path by picking out the breweries that most appeal to you or make it a multi-day event and visit all of them. 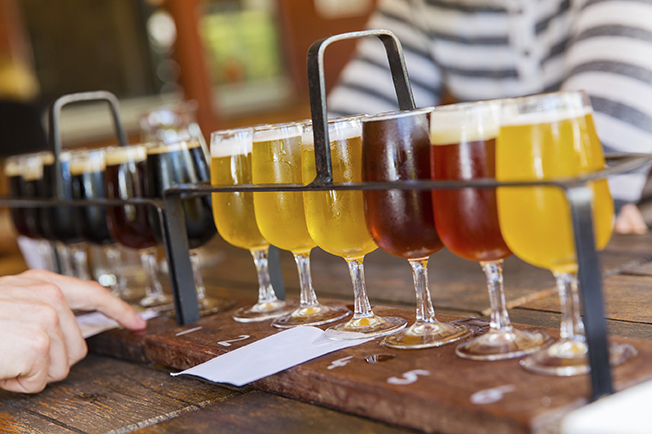 Sample artisanal beer styles like hefeweizens, Belgian dubbel and tripel ales, India pale ales, porters and many more. Whether you visit a few or all of the breweries, beer geeks and novices alike are certain to find a palate pleasing beer and a strong sense of community along the craft beer trail. Brewers in Denver and throughout Colorado have poured their craft since long before brewpubs started popping up on every street in any given city. Denver alone has more than 100 brewpubs and breweries, and produces more beer than any other urban region in the country. Check out the Denver Beer Trail, a self-guided tasting tour of 20 local brews, based on the beer rather than the brewery. Sample the citrusy and untraditional Selfish pale ale from the Lowdown Brewery & Kitchen and celebrate the Rockies with the Elevation Triple IPA from Renegade Brewing Company. Try a heavy-hitter like the barrel-aged First Descent Old Ale, clocking in at 15.5% ABV or go light with the kolsch from Prost Brewing Company, a delicate 4.5% ABV. If you’re really serious about discovering Colorado’s brews, pick up the Beer, Wine & Spirit Drinker’s Guide to Colorado for a guidebook, map and coupons to help show you the way to the closest brewery, wherever you may be in the Centennial State. Stone Brewing Company may be the most well-known brewery in the San Diego area – and the trip to the gorgeous brewery and tasting room in Escondido is well worth it – but now, more than 90 craft breweries and brewpubs call the San Diego area home, from Oceanside north of the city to Chula Vista just minutes from the Mexican border. Take the COASTER train to sample brews outside of the city like Legacy Brewing in Oceanside, Culture Brewing in Solana Beach or Amplified Ale Works near La Jolla. Be sure not to miss favorites like Ballast Point, Latitude 33 and Green Flash breweries as well. One of the best things about drinking craft brews in San Diego is that most breweries, brewpubs and tasting rooms have excellent food to accompany the brews, focusing on seasonal California ingredients that pair perfectly with the drafts on tap. To help plan your beer adventure, check out the San Diego Brewers Guild 2015 Craft Beer Map & Guide. Grand Rapids shares the rank of Beer City, U.S.A. along with other favorite beer towns Portland, Oregon, and Asheville, North Carolina. Many beer-centric businesses here are well-known among craft brew aficionados, like Founders Brewing Co. and Brewery Vivant. HopCat has been named as the best brewpub in the nation, while Siciliano’s Market won the title of Top Beer Grocery Retailer in the U.S. Lesser known local gems include Hideout Brewing Co. and Harmony Brewing Co. Grand Rapids’ 15 breweries can be visited through a number of tours like the 15-person pedaling Great Lakes Pub Cruiser or the more traditional Grand Rapids Beer Tour. The Grand Rapids Beer City Ale Trail is a great self-guided tour to be sure you don’t miss any of the tasty brews in this Michigan city.